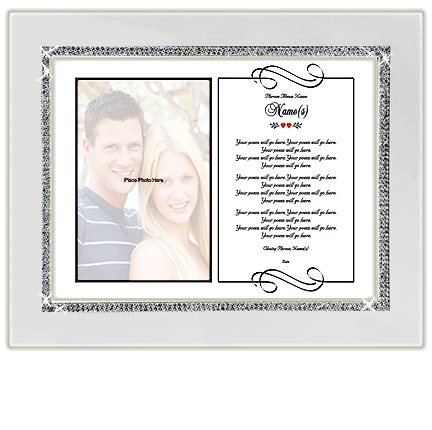 Frame a poem, wedding vows, or a wedding invitation in this beautiful picture frame with photo area. This stunning silver frame has a mirror finish. A border of encased shiny crystals surround the photo and poem area. You write the poem and we will design it and personalize it for you. Will do the same for wedding vows and/or wedding invitation. Add a favorite wedding photo for a custom wedding keepsake. A wedding day will be remembered for all the joy it brings. Commemorate this all important day in your lives by writing a poem to your husband or wife that expresses what's in your heart. What a great wedding gift idea for him or her. Not feeling that creative? How about letting us design your wedding vows or your wedding invitation in this exquisite design. Type the invitation wording or wedding vows in #5 above and we will take it from there. The outside dimensions of this beautiful picture frame are 10-1/2" x 12-1/2". Whatever you choose to do, you can feel confident that the finished product will be a truly unique and beautiful wedding keepsake. Your Poetry Gift can be designed with or without a cut-out opening next to the poem. Underneath the poem and photo cut-out is a heavy stock paper with the words "Place Photo Here. There is no need to send us a photo. You or the gift recipient can easily add a photo after the Poetry Gift arrives. The photo is taped on that paper and positioned so that it is in back of the opening. You have the option of attaching a photo before you give the person the gift or the person receiving the gift can easily attach their photo. The photo opening is approximately 4" x 6". 5. Please type in your poem (do not use all upper case lettering) - This is where you will type in the poem, verse or sincere thoughts you have written. A Poetry Gifts designer will take the lines of type and design it into the Poetry Gift above making sure that it looks its best. Please look at the above design in order to determine a suitable poem length. We suggest your poem is 16 lines long with a maximum of 16 words per line. There are no set rules; this is just a suggestion. If your poem is much longer than the length we are suggesting, the font/type will need to be made smaller to accommodate your entire poem. On the order form, please make sure to type your email address that you check often and phone number in case the designer needs to reach you with any questions. Unless you have permission from an author or poet, please only submit non-copyrighted works. And there you have it...a meaningful personalized gift for a family member or friend to be read and enjoyed for years to come. 5 out of 5, Based on 4 Reviews. Absolutely beautiful!!! I am beyond happy with my purchase!!! I LOVE EVERYTHING ABOUT IT!! It was my first purchase and I will definitely be coming back to purchase more items! I composed a poem for my daughter's upcoming wedding. Thank you so much for making my gift even more memorable and beautiful! I love the picture frame, format and inscription of the poem. Also, excellent customer service when I called with some questions. You can see right away the advantages of small family business which is a backbone of our beautiful country. Love Love Love the frame. And so did she. Thanks! Wanted to get something special made for my wife. I searched for Elizabeth Browning Barrett's poem written on something that would look good in our home. Finally I found this company. They were able to add a photo and print this poem perfectly. Would highly recommend this service. Engagement Gift for the Happy Couple! Anniversary Gift for Wife "The Love of My Life"